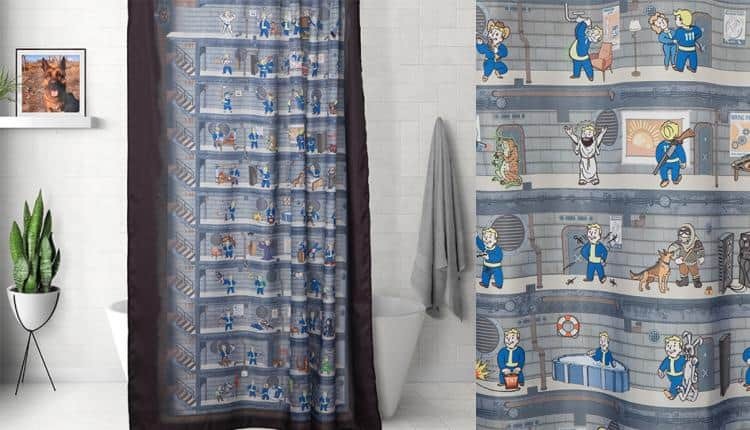 Fallout Shower Curtain | Nerd Much? Ocean themes are so abundant and popular for bathrooms these days, but they can get very boring. If you are someone who likes a little interesting detail in their decor, look no further than this Fallout shower curtain. Made after the Full Perk Poster from Bethesda, you can see all of the pip boy icons for almost every ability in Fallout 4. As usual for the game franchise, the dose of humor is never too far. Some perks, like strength, start out making perfect sense. Like hitting a baseball. But then the next levels show pip boy building something. By the end, we see he is wielding a Gatling gun at his hips in a very suggestive way. Or charisma, which at first shows pip boy popping out of a sale poster, the next we see him stabbing a woman while she is still in his arms. Needless to say, this shower curtain is an exact depiction of the Perk Poster. For those worried that it might not match the rest of their bathroom decor, the basic colors here are a dark brown and blue-grey. This would look best in a dark-themed bathroom, preferably with black, brown, or blue motifs. If you care a little less about color-matching, then this shower curtain will fit in any bathroom. The Fallout shower curtain is 100% polyester, but that does not make it immune to ink bleeding. Be sure to wash this curtain in cold water and keep a shower curtain lining around to protect it further while in use. If you have any small humans roaming your household, keep in mind that this Fallout shower curtain is a bit graphic. Most of the pictures depict blood and murder in some way, so either be prepared to explain what is going on or whatever you prefer to do.